Home › Reviews › What’s The Be The Boss Network? What’s The Be The Boss Network? Well, it basically its a Multi-level Marketing (MLM) directory, where they include MLM reviews of their so-called best business opportunities. Their cream of the crop so to speak in order to save you time and money, by eliminating the need to find an honest, proven money maker on your own. A place for MLM companies to submit and/or pay to have their specific company listed within Be The Boss Network directory. Be The Boss Network (BTBN) does this by matching you with the right company that suits your individual traits. For example, some people are born salespeople, and some are not, so if you are a born salesperson they would obviously set you up with a program where your talents would lead you to success. BTBN claims that each opportunity that is on their website is a legitimate business that offers direct selling. They claim to have helped over 200,000 people find good business opportunities already. BTBN also in turns provides business owners the availability of finding people seeking personal financial growth by being listed on BTBN. In turn, a place to openly market your MLM company to the masses at this one-stop MLM directory. 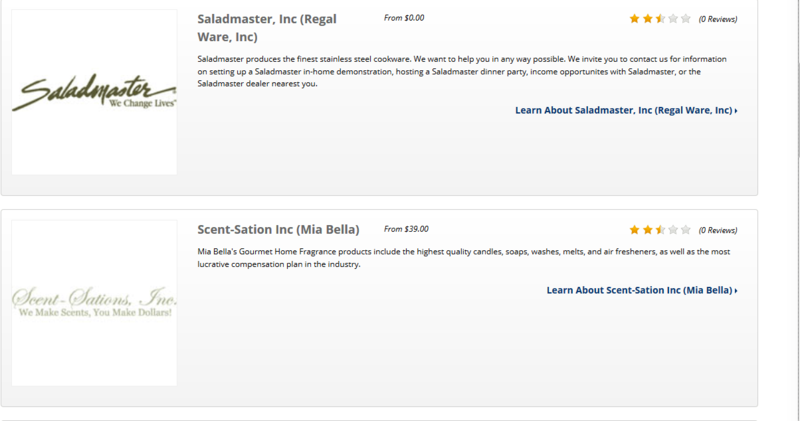 They offer two types of listings for business, the free basic listing, and a premium listing, where you pay to be listed. The premium listing would probably get more eyes laid upon it than the free listing, and that is why payment is sought after. More leads, I guess. BTBN wants to the middleman between you and whatever MLM company. Why? Because they get paid for some of the referrals from business looking for referrals. When I created an account with a junk email service I use for questionable sites, BTBN said they matched me with nine additional MLM companies. Really? How by just using my email address and no other personal information. Come on…I wasn’t born yesterday. This leads me to believe they just push whatever company that pays them, totally destroy all and any potential credibility from BTBN. I clicked on one of the companies, and it had the usual sales tactic of a video with no information about the company’s name and no pause button. Making you sit through a twenty-minute video of pumping and mind control tactics. For those that don’t know, 99.999% of the time these are scams, any company that resorts to this kind of marketing is a scam. I will literally close out the page immediately when I run across this. Why? Because IT”S CALLED TRANSPARENCY!!! If you are hiding something, it’s for a reason. If you have credibility, you want exposure. A proven method of building a business for yourself, check out my Review of Wealthy Affiliate, it’s my number #1 recommended program. With none of the shady tactics and with 100% transparency. BTBN is completely free to join for opportunity seekers. Their list has a rating system as well as reviews and entry price. General information and sometimes detailed information on companies. Provides a place for a large listing of different MLM companies. Has a newsletter to inform you. Mixed directory of good and bad companies, know scam as well a legit company makes finding one not so clear as they would have you believe. MLM companies, I don’t like or recommend trying to make money from MLM companies. They say they do research and specifically match me, but in fact, the offer me three companies with no detailed information about myself, other than signing up. Signing up they ask me to like them on Facebook. I don’t like this, and this doesn’t serve me as I have just signed up and know nothing about this company, yet they want me to promote them without knowledge. Weird. There is, in fact, no matching just a general pointing to companies that have paid to be promoted. Dishonest. Asked no questions about my self, except the standard name, email address, and zip code. No vested interest in opportunity seekers success. MLM sales pitches scare more people than Donal Trump and Hilary Clinton combined. My advice on this site is to read everything with a grain of salt that is presented at BTBN. Don’t take what you read here as gospel, further research is needed, but for a general directory of MLM companies, it seems okay. Use a garbage email service if you really need to sign up to BTBN. That way your email won’t be spammed with junk emails. Avoid the Multi-level Marketing field altogether, it’s just a very hard sell in general. I don’t recommend any MLM company as most people are aware of its controversial pyramid type scenes and marketing strategy. But if you are looking for a good MLM company you might be able to weed through the list to find a couple of honest working business models. If you are searching for something that positively works and is very solid I suggest you take a look at My Review of #1 Recommended program here. It’s what I use, and I am a member. No training that I can find. It should have training on how to avoid scammy MLM companies and ways to protect yourself. For the sake of this review, I am only dealing with the opportunity seekers part. This part is totally free, but be cautious about sharing your email address and private information. What is Be The Boss Network? I find that Be The Boss Network as maybe a helpful directory for MLM companies, but I do not think they match you specifically with the right MLM company. I really dislike dishonesty. I like the directory idea, but I don’t like the general field of MLM. I find it misleading and limiting in scope. There is positive aspect of Be The Boss Network which highlights the entry price and reviews (although most have only a review written by the person submitting the company to be listed). Which is not always a true reflection of reality. Getting information that is free is wonderful, and there is helpful information to be had here, but it is also mixed with known scams. Which leaves the credibility of the site damaged. The low rating I give BTBN reflects this assessment. As I mentioned above, if you are looking for a 100% legit way to make money, by owning your own online business. It provides the best training online along with the most helpful and friendly community online, with all the support to get you building your online business. I recommend you read my #1 Recommended Program and sign up to get started today. ‹ Is TeeChip A Scam?